All her friends had a grandma and a grandpa. When little Julie asked her mother why she did not have any grandparents, her mother only said: “They died a long time ago, Julie.” As she continued to ask, her parents finally said: “Grandma and Grandpa were killed during the war, Julie.” When Julie asked her uncle about the numbers tattooed on his arm, he did not want to talk about it. “That is my phone number, Julie,” keeping the truth hidden. When she grew up, Julie Kohner learned more and more details about the terrible events that devastated her family. In Julie’s home, the Holocaust was now talked about, there was even a special ritual: during the Passover seders, when Jewish families remember the slavery and the exodus of the Jews from Egypt, Julie helped her father, Walter Kohner, to set up a 16mm film projector on the table, while her mother Hanna preferred to quietly do the dishes in the kitchen. 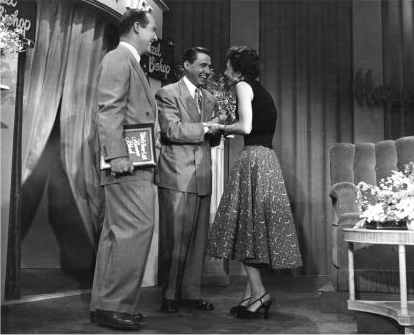 The film was running, Julie was listening, and the words were burned into her memory: “Upon arriving at Auschwitz, you were given soap, and you went to the showers,” said the host of the television show “This is your life” to a young woman who was seated on a television stage in Hollywood on May 27, 1953. “Your shower had water, others were not as fortunate, like your mother, your father and your husband Carl. They all lost their lives in Auschwitz.” In those days, this US television show usually presented celebrities. On this day, however, the NBC television show presented, for the first time on national television, the personal story of a Holocaust survivor. The guest of honour was Hanna Bloch Kohner – Julie’s mother. “Please inquire of past generations…Shall they not tell you?” As an adult, Julie Kohner has probably taken this challenge from the Old Testament (Job), because since 1991, she has developed organization, a public non-profit charity financed by donations, for Holocaust education in the United States called “Voices of the Generations”. In Germany, “Holocaust Education” is a relatively new concept. It does not only include education about a specific historical event, but also a systematic moral education against racism and for peace, tolerance and non-violence. More and more US states, Canada and other countries are already developing curriculum with this objective. As a former teacher, Julie Kohner knows that especially children have to identify with personal fates before being able to understand what millions of people suffered in the Nazi death camps. But she also speaks to adult listeners, and the story she tells is more than a program. It is the story of her mother which has become her life’s mission. Hanna Bloch grew up as a child of Jewish parents in Teplitz-Schönau in the Sudentenland, where she fell in love with Walter Kohner in 1935. When in 1938, German troops occupied the Sudetenland, Walter could flee the Nazis and emigrate to the United States because his older brothers were living there. He wanted to have his fiancée Hanna join him later. When this was not possible for him, Hanna fled to Amsterdam. 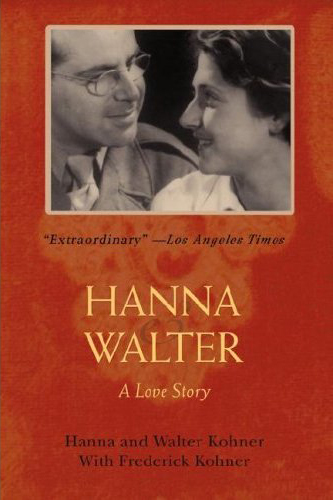 When in 1940, Hitler’s troops invaded this country, too, Hanna gave up her hope to marry Walter in the States. At first, Hanna could avoid being arrested because she worked as a secretary for the “Jewish Council”. In Amsterdam, she met Carl Benjamin, a German refugee, whom she married in 1942, thereby saving him for a while from being arrested. In 1943, however, Hanna and Carl were arrested, too, and transported to Westerbork – staging post for their deportation in 1944 to Theresienstadt and to the extermination camp Auschwitz. Just now Hanna was pregnant. She anticipated that this was like a death sentence in Auschwitz. In order to have a chance of survival, she was told to secretly have an abortion. This was only possible with the help of her brother, a doctor, who was at Auschwitz, too. End of October 1944, he convinced a female doctor to perform the abortion. This was not the only time that Hanna Bloch escaped death. In November 1944, she was brought to Mauthausen, a concentration camp near Lenzing, Austria. When the Americans liberated Mauthausen on May 5, 1945, Hanna as a forced laborer was one of the inmates that had escaped being murdered. Before the US soldiers moved on, some of them offered to send a note to the survivors’ friends or relatives in the States. “I have a friend in California,” Hanna stammered in her school-English, to an officer. “He lives in Los Angeles, Sunset Boulevard.” And it really worked: Walter Kohner received the letter in a roundabout way in Luxemburg. 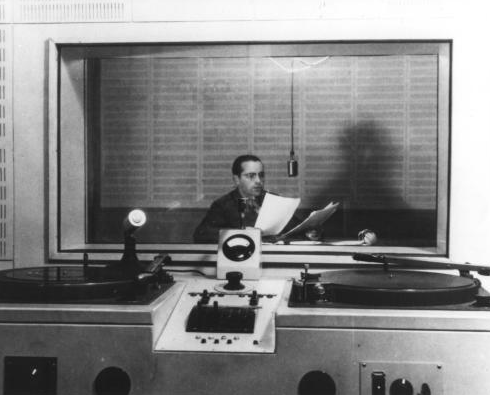 He had returned to Europe with a special US military unit and was a news announcer at Radio Luxemburg. When he learned that Hanna was alive and safe, he immediately left and tried to find her – in Germany, Czechoslovakia, across Europe. He found her in the Netherlands. 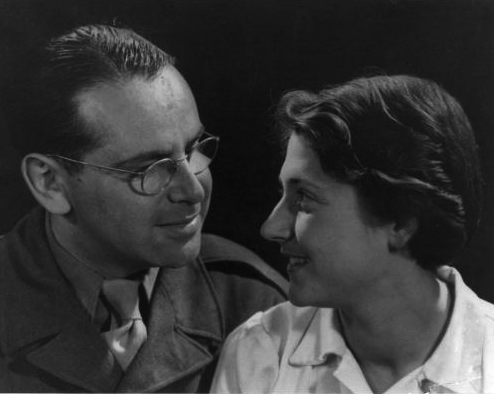 On October 24, 1945, Hanna and Walter were married in Luxemburg. In July 1946, Walter returned with her to Los Angeles. During the abortion in Auschwitz, Hanna had been told that she would never be able to give birth to a child. Hanna was not willing to accept that. After eight miscarriages, she gave birth to a daughter on July 4, 1955: Julie. But the long-desired child also remembered her mother of everything she had lost. “Why did I survive? Why me?” were questions which both, mother and daughter, asked. The fact that Hanna had survived was owed to chance. Without her friends, she would never have been able to stand the endless counts in the concentration camps. The refusal of a Russian war prisoner to poison the meal of the remaining inmates, too, prevented her from almost dying. But the most important thing was the moral support of the other inmates. For Hanna, these answers were not satisfying. But they were the only answers she was able to give. Lifelong feelings of guilt towards those who were murdered were the price she paid for having escaped hell. In this way, the Holocaust trauma also impacted the children of the survivors called the “Second Generation”. 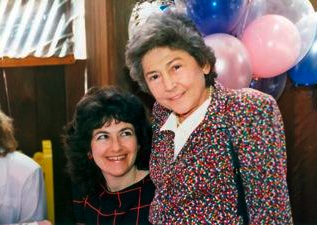 Their parents survived the fire, but the children grew up close to the heat of its flames, as Florabel Kinsler, a Holocaust psychologist, once said. Julie felt very close to her mother, so close that she got an anxiety disorder when she moved to Oregon for her studies when she was 18. So she returned to Los Angeles and continued to study there. The family used to spend Mother’s Day at the cemetery where Walter Kohner’s mother was buried. On those days, Hanna Kohner would talk about the children she had lost. Julie was reminded that she almost had brothers and sisters. She felt she had to make up for all those lost children. She had her own feelings of guilt. The Holocaust education program that Julie Kohner has developed is based upon Hanna’s story and includes the TV show where her mother appeared, and upon the book “Hanna and Walter – a Love Story”, which her parents published together with Julie’s uncle in the United States in 1984. When Julie speaks about the terror of the Nazi times and the death camps in Europe, she always carries a little blue box with her. In this box, her mother kept a charm bracelet that was presented to her at the end of the TV show. 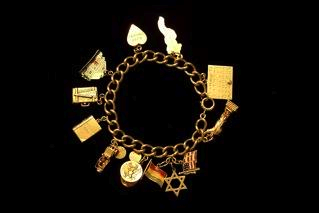 The charms were meant to symbolize Hanna’s life. Hanna seldom wore the bracelet. Perhaps because the real symbol of her life, of her survival, was always near her: Julie, whom she entrusted unspokenly with the mission to bear witness and pass on the memory of the Holocaust. In 1990, Hanna Kohner died from a heart attack at age 70, perhaps a long-term consequence of the inhumane living conditions in the concentration camps. One year later, Julie started her project “Voices of the Generations”.. She wants to present her program not only in the US, but also in Europe, especially in Germany. Julie has developed a curriculum for teaching Hanna’s story to American school children, and has gone one step further. Together with a project partner she is creating a web 2.0 platform where children and grandchildren of the victims of the Shoah can present their personal stories and experiences by means of videos. The platform will be called “Echoes of the Past” – and is also meant to be an archive for educational purposes and coming generations. The number of time witnesses and survivors of the Holocaust is constantly decreasing. The psychologist Dina Wardi once called the sons and daughters of the Holocaust survivors “living memorial candles”. Julie Kohner is one of them. An excellent article. I hope there will be many, many readers. I’m so glad to see it in Der Spiegel at long last; a door has been opened. I filled in this area; then went back to look for something; clicked on something which probably wiped out what i wrote here; I will now be more cautious. This is such a touching story; I hope I can find my way back to it but I may need help. I got here by googling ”Der Spiegel 1940” or something like that but if i do not have it exactly it probably won’t work. I wondered if Der Spiegel existed during the Nazi horror and if so what it was like. John Neumaier, a Jew born 1920 in Germany, lost his mother, an opera singer, to the holocaust. His daughter, I think Diane, a professional photographer, has created a program about her titled ”A Voice Silenced. i will try to find out more about it and I hope I will then be able to get back here. Virtually all of the things you articulate is astonishingly legitimate and it makes me ponder the reason why I had not looked at this with this light before. This particular piece really did switch the light on for me as far as this topic goes. But there is 1 point I am not too comfortable with so whilst I make an effort to reconcile that with the main theme of your issue, allow me observe just what the rest of the subscribers have to point out.Very well done.